Paul Haberman was happy living alone in the city until he met Cynthia, an enchanting suburban single mother. After he moves to New Jersey to marry her, Paul’s life reshapes itself dramatically around his new family and home, evolving over the years in ways he could never have imagined. In this funny, moving, episodic novel, Scott Nadelson reveals the quiet beauty, doubt, and longing of a blended family’s life in the unglamorous American suburbs. Scott Nadelson’s remarkable new novel Between You and Me is both enormously entertaining and seriously moving. Nadelson reports on the human condition with joy, humor, and lapidary insightfulness. Here is a writer who is beautifully (and alarmingly) awake and observant. Between You and Me is one of the best books I’ve read in a long while. Scott Nadelson has an uncanny way of getting under the skin of his characters and capturing the day-to-day rhythms of complex lives. His people may think of themselves as ordinary, but they are anything but. They’re survivors – and the stakes here are high. 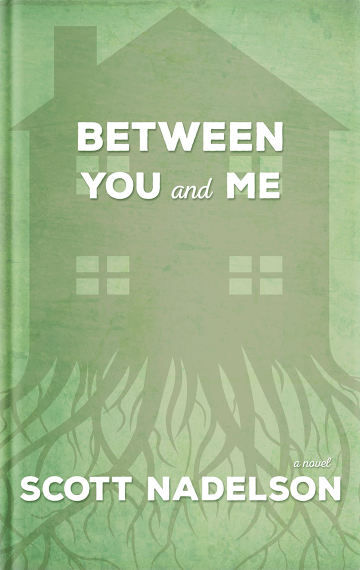 Between You and Me, is a clear-eyed, generous, intricately structured, and ultimately profoundly moving novel. Scott Nadelson gives us a true Gogolian hero in Paul Haberman, a small, yearning, middle-aged suburbanite in New Jersey, beset by vague terrors and also by a trembling awareness of all the world has to offer, while not knowing how to ask, most of the time, for any of it. Haberman is a radiant character and Between You and Me is a hilarious, poignant, darkly glittering gem of a novel. What a wonderful and affecting novel Scott Nadelson has written. As is clear from the hilarious opening standoff in a New Jersey mall parking lot, the author has a talent for zooming in – with uncanny psychological precision – on the small, defining moments of individual experience. And yet the story that results, as we revisit Paul Haberman over two decades of his adulthood, becomes that of a universal everyman, whose equivocal life seems more and more resplendent as we follow him through the years. Scott Nadelson’s novel, Between You and Me, grows on you, gains weight chapter by chapter as its hero, Paul Haberman—step-father, husband, lawyer, son and brother—stumbles his way through passive and passionless middle age to stand, finally, in his own skin as man and to affirm his life. The ending is beautiful. The beginning and middle pieces add up, finally, like any good befuddling adventure, to something astounding. Something extraordinary. Yes, I said, when I’d read the last pages, yes. Here’s what Scott Nadelson knows: that the terrors and ecstasies of everyday life can bring you to your knees; that even a mild-mannered Jewish lawyer can be a hero. Like Yates’Revolutionary Road or Updike’s Rabbit series, Between You and Me is a beautifully written and moving chronicle of American suburban angst, though Nadelson’s version comes with a wonderfully refreshing dose of humor and gratitude for the blessings of family, health, hearth, and love.